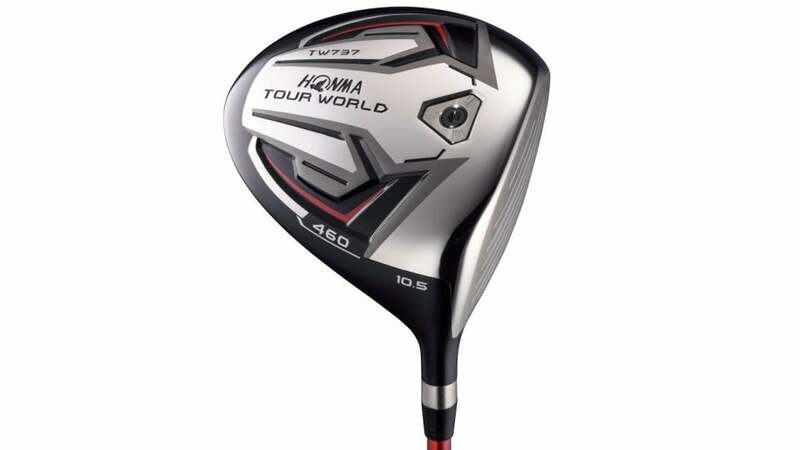 The Honma TW737 460 driver. SPECS: 9.5°, 10.5° with Vizard EX-A, EX-C, and EX-Z shafts. RECOMMENDATION: Aimed at mid- and low-handicaps who like a lighter feel with low spin and solid forgiveness. KEY TECHNOLOGIES: Rolled titanium face provides faster ball speed and distance; Shallow CG with 8g weight forward in the clubhead lowers spin rate and increases launch; Redistributed weight in the heel area improves forgiveness on off-center hits. Honma's been making super-premium clubs for years but never had a significant presence in the U.S. until now. The TW737 is a legit high-launch, low-spin offering that keeps spin rates down via a more forward CG location and a hot face. Those looking for a lightweight option with solid distance and ample forgiveness with a brand that's a bit more exotic would do well to give the Honma a look. "Forward CG location helps cut spin for all types of players, producing good distance for the category, with more forgiveness than expected. Lack of adjustability can make fitting more challenging for some."